For dancing, add LaRhonda Steele, a dynamic and talented singer with exceptional stage presence. You'll know her roots are in gospel when you hear her sing the popular hits of Swing, Blues, R&B, Rock and Disco! She has performed with many of Portland's best bands including Curtis Salgado, Ocean 503 and Norman Sylvestor, and impressed audiences at the Mt. Hood Jazz Festival, Waterfront Blues Festival, and her regular gig at the Candlelight Bar. click here for LaRhonda's SONGLIST! 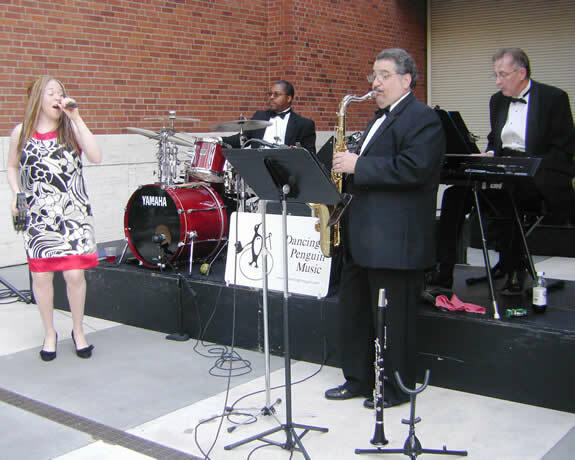 This talented band performs at the finest hotels and country clubs, and is recommended by event planners and booking agencies throughout the NW. They'll make announcements in a formal style, and help coordinate your event. A Dancing Penguin Band will keep the dance floor full, make your guests happy!